At Macungie Church of the Nazarene’s Grow Christian Preschool, we nurture children and help them flourish in every area possible. The teachers provide a loving environment where we encourage cooperation and build confidence. Children work together as they develop strong pre-reading, pre-writing and pre-math skills, all while playing games, singing songs, and even mixing up yummy treats. The children have so much fun at our preschool that they don’t even realize they’re learning!! At Grow Christian Preschool, we emphasize Christian values and loving one another. Children learn how to be a good friend and how to get along with others. They also get to know God and His son Jesus through Bible stories, praise songs, and chapel time with the pastors. The children meet Prayer Bear, a special friend who encourages them to pray. The caring teachers help the children grow in their relationship with God by showing them His love each and every day. We believe music is a great teaching tool and use music in all sorts of ways to encourage learning. We use a special song to help the children learn to spell their names, tunes to transition from activity to activity, a familiar song to signal cleanup time, and always make time to play instruments and dance! At Grow Christian Preschool, we go beyond preparing children for kindergarten. We plant the seeds of faith and foster a love of learning that children take with them so they continue to blossom throughout their lives! At Grow Christian Preschool, we use a variety of games and activities to help the children learn to recognize their colors, shapes, letters, numbers, and their names. Children learn to spell and write their names and practice counting to 20 and beyond. We focus on strengthening their fine motor skills, so they are able to hold a pencil properly and use scissors independently. We also work on social skills, listening, and following directions. Four-year-olds learn the letter sounds and work on properly forming each capital and lowercase letter. 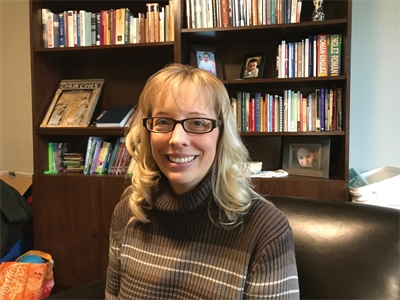 Deanna Portz is the Director and Lead Teacher of Grow Christian Preschool. She has a Bachelor of Arts Degree from Moravian College and seven years experience teaching at the preschool level. She also has experience at the elementary level working with children with multiple special needs. Deanna came to Macungie Church of the Nazarene with her family about four years ago looking for a church home and felt welcomed into Macungie’s family. A former writer and editor, she switched careers years earlier when she felt called to teach God’s love and word to children. Deanna had just left a job as an assistant preschool teacher when she and Associate Pastor Paula Creely sat down to a get-to-know-you lunch. The seeds for Grow Christian Preschool were planted that day, as Paula discovered Deanna’s teaching aspirations and shared with her the church’s desire to open a Christian Preschool of its own. In addition to directing and teaching at Grow Christian Preschool, Deanna serves as a substitute Teacher and Instructional Assistant for East Penn schools. She also leads Macungie Nazarene’s Youth Group and helps with Children’s Church and Vacation Bible School. She lives in Emmaus with her husband, Andy, and their two children, Austin and Abby. What do parents like most about Grow Christian Preschool? "The teachers! Mrs. Portz is wonderful with my son and he loves her! Can't wait to bring his younger brother here :)" --Amanda N.
"The atmosphere of the classroom is wonderful. The teachers are friendly and caring." --Amy H.
"The price was perfect. Our son learned so much this last year. The teachers were very professional and the communication between the teachers and parents was perfect." -- Jonathan W.
"I loved the lessons. Mrs. Portz did a great job putting them together and an amazing job teaching them." --Marcia H.